I will provide you with my recipe to make chicken Khow Soi. This unique mix is redolent with oriental spices, it contains: cumin, cassia bark, coriander, turmeric, black peppercorns, fennel, star anise, cloves, nutmeg, white cardamon, mahkwaen. If you have been to Chiang Mai and eaten Khao Soi there it will take you back there in one bite! Although these spices are made with specific equipment I do cook with fish and nuts in the same kitchen so I cannot guarantee it is allergen free. Tin contains 50g of Gaeng Hung Lae powder. 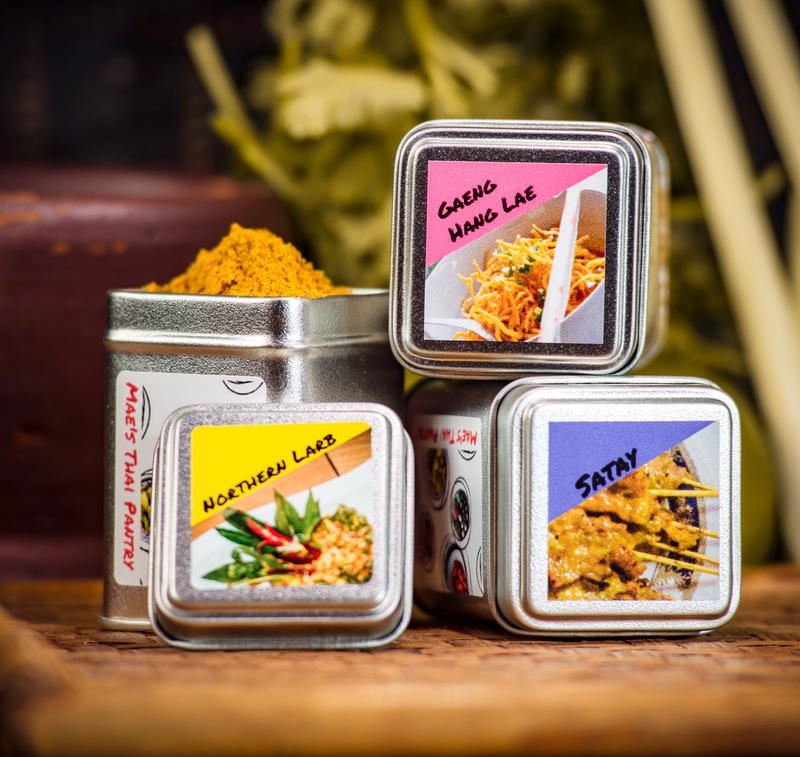 Satay Powder – This delicious spice mix is perfect to make a marinade for all types of satay, chicken, beef, pork or tofu. I will provide you with recipes to make chicken satay and a quick and simple peanut sauce. This unique mix is redolent with oriental spices, it contains turmeric, cumin, coriander, cassia bark, black peppercorns, fennel, star anise, cloves, nutmeg, white cardamon and makhuen. If you have been to Thailand it will take you back there in one bite! Tin contains 50g of satay powder. Northern Larb powder – This delicious spice mix is perfect to make a classic Thai salad dish called Northern Larb which is delicious, quick to make and it is eaten with raw or lightly cooked vegetables. I will provide you with my recipe to make Northern Larb. This unique mix is redolent with oriental spices, it contains: Fennel, long black peppercorns, pro horm, star anise, coriander, makhweaen, white cardamons, salt, mace, cassia bark, cloves and nutmeg. It is an absolute favourite at my supper clubs and the taste profile is so different it really surprises everyone! Tin contains 50g of Northern Larb powder.